The most frequent advice Cézanne offered to young artists—and the constant rule for his own life—was to study nature, to observe her inner logic and perceive her truth. And then artists must set themselves the task of delivering these hard-earned perceptions to the public in the most powerful way possible. Here in this painting Still Life with an Open Drawer Cézanne has bequeathed to us, his viewers, a visual feast for late summer. Not that Cézanne is trying to describe here any particular time or any particular season. In fact, he has been very careful to limit what we see. Upon a wooden sideboard (drawer open), we are given a mirror in a wooden frame leaning against a blue-green, violet-shadowed wall. Upon this structure of browns and blues, the artist has placed a blue pottery bowl and a glass bathed in exquisite bluish reflections; and finally we are greeted by intensely coloured fruit, mostly apples, lying upon and overflowing a cobalt blue-rimmed plate. Contrasted against the cooler, hand-made elements of the painting, these fruits of nature come toward us like a glorious welcoming party. They are rich and beautiful, stroked by Cézanne’s brush thoughtfully, fulsomely. It is evident that this fruit—the glory of their colourful existence in space—is the focal point of the painting. Now there are many things that Cézanne has expressly declined to give us, things that we have likely come to expect in still life paintings. For example: do we feel enticed to grasp one of the apples? Can we sense the smell or the texture of its skin? No. Cézanne is clearly not trying to mimic reality or present a trick of illusion. With his prominent and varied brushstrokes he is careful in the objects he paints to avoid a slick, photographic effect: in some places, like in the pottery bowl, the paint does not even cover the canvas. And unlike so many still life paintings, this one does not suggest a window opening onto a false space. Although there is sculptural weight to his objects, he refuses to use the artifice of vanishing point perspective. Notice how the direction of the edge of the drawer contradicts that of the dresser’s edge. Moreover, the flattened rim of the blue plate makes it clear that another logic rules. Nature. Truth. Now logic: observe how the lines and gentle angle of mirror and shadow anchor the image and how the calm horizontals of the dresser and its drawer and even the plate’s flattened edge provide order and balance. 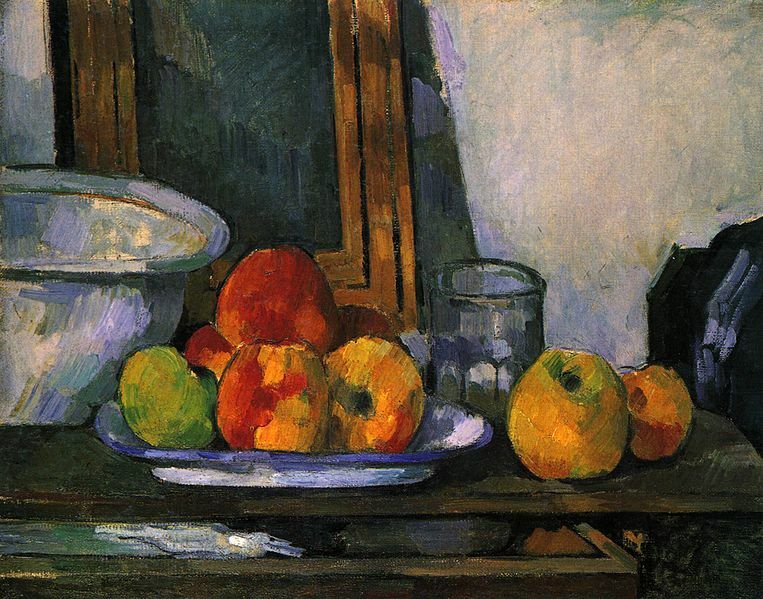 Upon this structure Cézanne has placed the rhyming curves of apples, bowls and glass and the riotous display of fruitful colour. In this painting Cézanne has distilled for us weeks, possibly months, of seeing and meditating and he has focused our vision using the language of paint and canvas, the vocabulary of line, shape and colour. Surely we live in a world of distraction, appetite and dullness of heart and are sometimes overwhelmed by the chance and fleeting changes of our lives. In Still Life with an Open Drawer Cézanne guides us to quietly acknowledge the underlying logic of our world and brings us to see its overflowing beauty in the context of the unchanging goodness of its Creator and of the Word or Logos through whom everything has been made. Paul Cézanne: Still Life with an Open Drawer, 1877-1879, oil on canvas, 33 x 41 cm, private collection. Paul Cézanne (1839–1906) was born in Aix-en-Provence to a well-to-do banking family. At the instigation of his school friend, writer Emile Zola, and braving his father’s disapproval, Cézanne left his university studies in law and turned to art studies in Paris. His rejection at the Salon in 1863 was the first of many, so that Cézanne’s art career in Paris could be considered a stunning failure. While in Paris, however, Cézanne encountered the fresh palette and outdoor working methods of the Impressionists. The Impressionists can thus be seen as revolutionizing his art, but Cézanne pursued his own quite distinct approach to art, eventually moving back to the south of France and working in relative solitude there. Now closer to his family, he also became more serious about his Catholic faith. During his lifetime Cézanne received little public acclaim for his art, but he was increasingly admired as a master by contemporary artists and became very influential in the development of 20th-century art, especially Cubism. Picasso and Matisse are said to have referred to him as ‘the father of us all’. Irena Tippett has a Master's degree in Art History from the University of Toronto, but it was during studies at RegentCollege, Vancouver, B.C. that she discovered more recently the beauty of her field in relation to her faith. While most of her energy is presently spent in women's ministry at St. John's Anglican Church in Vancouver, she continues to lecture from time to time out of this newly found passion.